An artist's rendition of a an Ares I rocket at Launch Pad 39B at NASA's Kennedy Space Center in Florida. The pad, previously used for Apollo and shuttle launches, will be modified to support future launches of Ares and Orion spacecraft. NASA could save $3 billionto $6 billion by dumping its Ares I rocket and flying Orion spacecraft and U.S.astronauts on upgraded Delta IV Heavy rockets, according to an independentassessment released by NASA on Tuesday. But the report also saidthat course of action would increase by $1.1 billion to $3.5 billion the costto develop NASA's Ares V heavy-liftlaunch vehicle. What's more, NASA estimatesit would cost an additional $14.1 billion to $16.6 billion to finishdevelopment of the Orion crew exploration vehicle if NASA switched to Delta IVHeavy rockets. The June 1 Aerospace Corp.report was released a day ahead of a presidential panel's final public hearingon the future of the U.S. mannedspace flight program. The panel will present options to the White House bythe end of the month. The report failed toaddress a key issue raised by Columbia accident investigators: crewsurvivability. The federally fundedresearch and development group, which played a key role in developing Air ForceDelta 4 and Atlas 5 rockets in the 1990s, limited the report's scope totechnical feasibility, cost, schedule and impacts to NASA's ProjectConstellation and national security space programs. "Aerospace did notperform estimates of loss of mission and loss of crew probabilities" forupgraded Delta4 Heavy rockets, the report said. Previous NASA studiesindicate Ares I would be twice as safe. Columbia investigators saidNASA should give "overriding priority to crew safety, rather than tradesafety against other performance criteria," when designing rockets andspacecraft to replace the agency's shuttle fleet. NASA is developing its AresI rocket to launch astronauts aboard Orion crew capsules. The Ares V moonrocket is to launch Altairmoon landers and rocket stages to propel the landers and Orion capsulesfrom Earth orbit to lunar orbit. The June 1 report focusedspecifically on the implications of replacing the Ares I rocket with Delta IVHeavy rockets. Ares V "carryingcosts" of up to $3.5 billion would result from stalling development offive-segment solid rocket boosters and a second stage engine required for theAres I and Ares V.
The huge rise in Orioncosts would be associated with adapting the capsules to fly on Delta IVs andrevising mission design work, environmental assessments and ground operationsplans. Among other costs:Maintaining the industrial capability to manufacture solid rocket boostersbetween the 2010 retirement of NASA'sshuttle fleet and the development of the Ares V rocket in the latter halfof the next decade. The Aerospace Corp. said ithad not independently verified NASA's estimates for Orion cost increases or theunderlying assumptions. 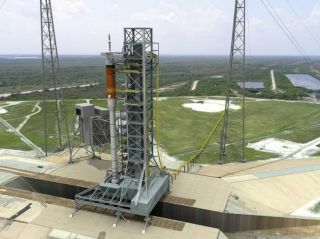 The development of a Delta 4Heavy rocket certified to fly astronauts would take 5.5 to seven years, thereport said. NASA says the Ares I rocketand Orion spacecraft is expected to fly its first piloted mission in March2015, although project officials privately acknowledge that target could slipto mid-2015. Orion spacecraftdevelopment would slip about a year, the report said.